Few skeletal metastases require surgical intervention. Radiotherapy, chemotherapy or both often provide symptomatic relief. An impending or actual pathologic fracture requires operative fixation because fractures through a tumor-bearing bone rarely heal without such intervention. The goals of fixation are to relieve pain, improve function and ambulation, facilitate medical and nursing care, and improve psychological well-being (Figures 11.1 and 11.2). The primary functional goal of surgical intervention is to allow immediate weight-bearing. Surgery should be avoided if this cannot be achieved. A variety of techniques, including prosthetic reconstruction (especially about the hip) or a combination of internal fixation combined with polymethyl methacrylate (PMMA), provides immediate fixation and stability. After the wound has healed, radiotherapy is usually used to arrest local tumor growth, permit bony repair, and prevent re-growth of tumor around the fixation device. 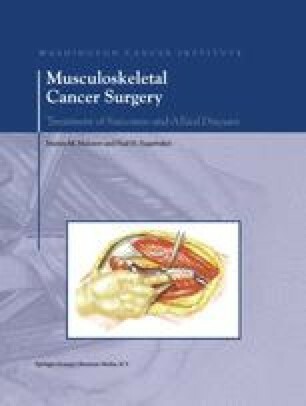 This chapter discusses the techniques of treatment of long bone metastases.